Monday’s events marking the first anniversary of the founding of the ANC will take place in the Bolivar Square in the Venezuelan capital Caracas. On July 30, 2017, the National Constituent Assembly (ANC) of Venezuela was installed. 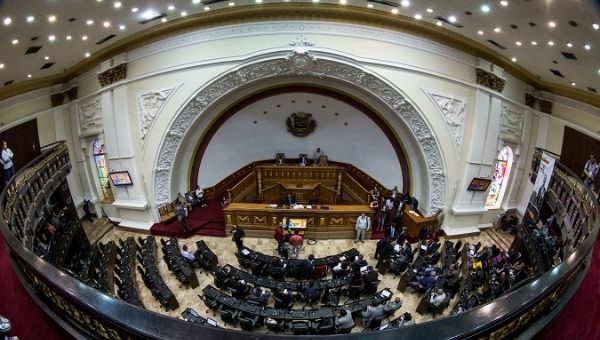 Its members were elected, by more than 8 million voters, for the writing of a new constitution that would expand on the constitution established in 1999 by then-President Hugo Chavez. So far the ANC has secured peace, justice and social and juridical security for the Venezuelan people. It was one of the measures taken in order to put an end to violent protests called “guarimbas,” promoted by extreme opposition groups, between April and July 2017, claiming at least 120 lives as violent factions of the protesters sought to generate social chaos in Venezuela in order to provoke a Coup d’Etat. The National Constituent Assembly election “was the moment in which we politically defeated the violent, terrorist, anti-democratic opposition of the right-wing. It was with the constituent elections that this phase began because we unveiled the international right-wing,” said Tania Diaz vice president of the ANC. The ANC activated different processes of debate and consultation with citizens throughout the country to work hand in hand with the people, in order to establish laws that benefit the whole country. On August 30, 2017, the ANC approved a constituent decree which installed the National Constituent Dialogue, to allow the improvement of a more productive and diversified economy for Venezuela. One of the main aspects the ANC has focused on is in the fight against the international and internal economic war waged against Venezuela by the United States and its right-wing allies in the region. It has approved a series of laws tofight this war and to ensure peace and economic stability for the people. Monday’s events marking the first anniversary of the founding of the ANC will take place in the Bolivar Square in the Venezuelan capital Caracas. “We will remember the heroic deed of the Venezuelan people,” said Diaz.